acuProducts are my passion because I LOVE teaching people to self-heal. It is the motivation behind everything we do. The world is definitely a better place when we are empowered to help ourselves. Some people ask me why they can’t just use a simple therapy ball that costs less than an acu-ball? It’s a valid question that deservers to be answered. So, why do I think acuProducts are better than commonly found round plastic therapy balls? Round therapy balls are just spherical plastic balls. Patented acuProducts are FAR more so-phisticated healing tools developed over 10 years of clinical and materials research. 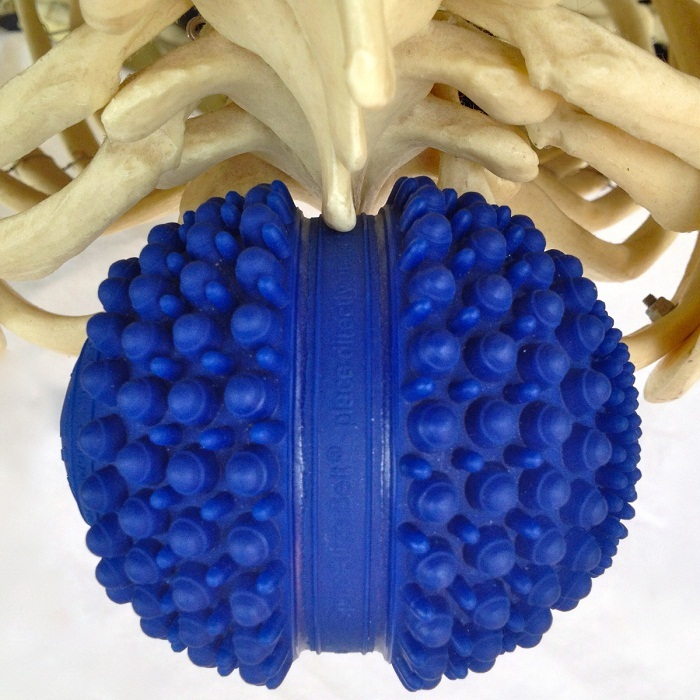 The overall therapeutic effect of the acuProducts’s advanced designs creates a completely dif-ferent healing experience vs. a spherical plastic ball. For the end user this translates to better pain relief & healing with less effort and significant cost and time savings. They are HEATABLE (for the acuBall 1 min. in the microwave or 10 min. boiling creates 72 min. of soothing heat). How does the heat last so long? It took years of work to get this prolonged heat effect – the acuProducts are filled with water which is the medium that holds the heat. Heat is hugely important therapeutically because it calms the central nervous system, physi-cally expands tight tissue, dilates blood vessels and flushes out built up muscle wastes that create pain signals. Technologically Advanced Design Features – acuProducts feature a recessed central groove called the Spine Align Belt allowing users to lie directly on their spine empowering them to re-lease tight spinal areas anywhere from their low back to their neck completely on their own. This notably reduces the need for professional care (in my patients the average was 30-50% less care needed). Don’t even try to lie directly on your spine with those simple round therapy balls – it will just hurt as your spinous process gets pushed into your body! Another unique acuProducts technological advantage is the two stage nib design. This was the result of many year of clinical trial and error. If the nibs were too pointy it would just hurt when you laid on it and the last thing someone with pain wants is even more pain! If the nibs were too flat no acupressure benefit would occur. 80 editions of the acuball later I finally got it right: the first aspect of the nib your body en-counters on acuProducts is smaller and round – mimicking the human fingertip. It’s easy for your muscles and connective tissue to accept this shape. As the body sinks lower and lower, relaxing and opening in the process – it then encounters the second much wider nib stage that can now more thoroughly open tight areas without causing a lot of discomfort. Start small, ease into it then go for significant release when the body is relaxed and ready to ac-cept it. was the best way to get the body to release tightness with minimal pain and discomfort. My research over the last 15 years has shown me that the act of rolling – which requires neu-rons to fire and muscles to contract – is in fact counter productive to deeper release. acuProduct releases do NOT require rolling motion — simply find the spot your body wants you to work on – it will guide you there if you try different spots – and completely melt into it for 3 minutes allowing your body to totally relax. This technique allows the body to open and release contraction and pain on a much deeper level with ZERO muscular and neurological activation. Simple to do & much easier than rolling – you get a better result with far less effort! Because no motion is required acuProducts are far easier for elderly and injured individuals to use (they can even be used in bed) thus our wonderful following in the thriving THERAPEUTIC community. And our coverage for Motor Vehicle Accident patients by their insurance compa-nies (all our products are FREE for them). We believe healing knowledge should never be held back. Over 27 years of clinical experience, self-healing research and first hand study of world healing traditions in over 30 countries I’ve learned a few things. This knowledge has been summarized into an easy to digest video catalogue. Our FREE APP (search acuball) and online “Click Where You Hurt” training program allows users to simply click on the part of their body that hurts to watch detailed step by step training videos that explain exactly what to do. Other product sites charge for ALL the info they give and ask you for your email address so they can sell it or market to it. At acuProducts we simply don’t believe in that way of doing things. Healing knowledge should be freely shared.The world gets better that way.